This is the second part of restoring ourselves as a people, individually. You are asking yourselves how could we restore our nation as a whole, individually? What I mean by this is that we all have to be responsible for our own actions. There is no getting away with the things that we do and then blaming society for the actions. I have noticed a growing trend in our culture. It makes me feel afraid. We are gradually becoming a nation of takers. This country was founded on guiding morals and principles of strong faith, hard work and personal freedom to achievement. I don’t pretend to be an expert, but I do know when things started getting out of hand. The years 1962 and 1963 saw a tremendous paradigm shift. These two years were morally cataclysmic. I am sure that the people who wanted and saw the end of prayer and Bibles in the class thought that they had won a moral victory. But what they accomplished was quite the opposite. You see, when people pray together, they join as one and evoke a spirit of humility. This humility is translated into words that agree with one another to invoke to a higher power. In cases where prayer is invoked, we see a sense of fellowship and community. That sense of community makes it harder for people to cheat or hurt one another because it is hard to do anything wrong to people when they become close to you. Prayer is this and so much more. It is a way to ask God for help and guidance. It builds character, gives you patience and makes you in tune with the God of the universe. When we lose this connection, we are like a plane or ship without a rudder. We will just go in circles or take a nose dive into the vast abyss of life. We were made as creatures who have an insatiable need to worship the Lord. But we have lost this and, therefore, are feeling the after effects of losing ourselves and our direction spiritually. Once we lost the ability to pray together in schools, the next common sense step was to get rid of our instruction book on spirituality. It is said that the Bible stands for, “Basic Instructions Before Leaving Earth” and although you may think that is a corny way of putting it, it holds true. It was 1963 when Bibles started disappearing from our public schools. Again, the person or persons who opposed having them, thought they had won big. But it was the beginning of the end for our nation. Does this mean that the years before 1962 were better than those that came after? Yes, they were. They may not have been perfect. Kids will always be kids, especially teens. But there was a sense of right and wrong. The Bible gives us instruction on how to act as people. It shows and guides us to do better for ourselves. If people were to read the Bible every day, there would be no excuse to do wrong instead of right. The Bible lays it out there in plain and simple language. It is a language of love and not hate. It is a language of others instead of me. The Bible can teach you all this and much more. 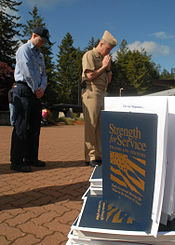 Tomorrow is the National Day of Prayer. I just can’t imagine why we would need to make an official day of prayer for this country. Every day should be a national day of prayer where everyone comes together in their own time and personal space to lift up our nation and each other. But more importantly, to give thanks and adoration to the Lord of the Bible. The One that can bring us back to where He wants us to be, in complete harmony with Him.